Friuli-Venezia Giulia is Italy’s most North-Easterly region. Like many European border areas, Friuli has a composite identity made up of Italian, Slovenian and Teutonic cultures. Those borders, which can seem so trivial now (on our visit, we drifted into Slovenia and back, with nary a battered sign to remind us), have been hard fought over during the past century. Everything from churches to vines was desecrated during the first world war, although there is little clue from the beauty and tranquility that now pervades the hills. The landscapes are frequently jaw dropping, with dramatic rolling hills, glimpses of the Adriatic and primeval bands of limestone extruded from the ground. It’s rare for wines outside the two “big ticket” DOCs (Friuli Collio and Colli Orientali) to make it to the UK. There is much to say about these fine sub-regions, but let us detour instead to Friuli Carso DOC. 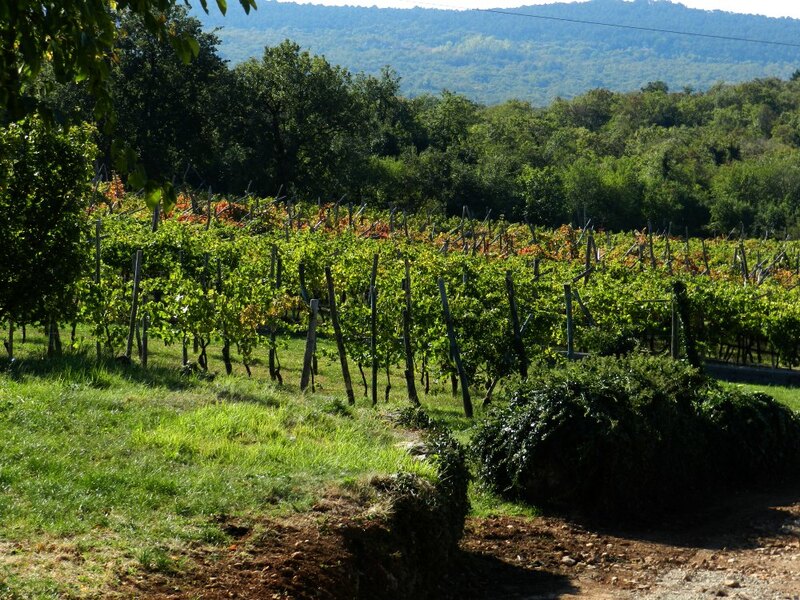 This hidden gem is located in the South-East corner of Friuli, on the Istrian peninsula bordering Slovenia. Carso (“Karst” or “Kras” in Slavic dialects) is the calcareous limestone rock. 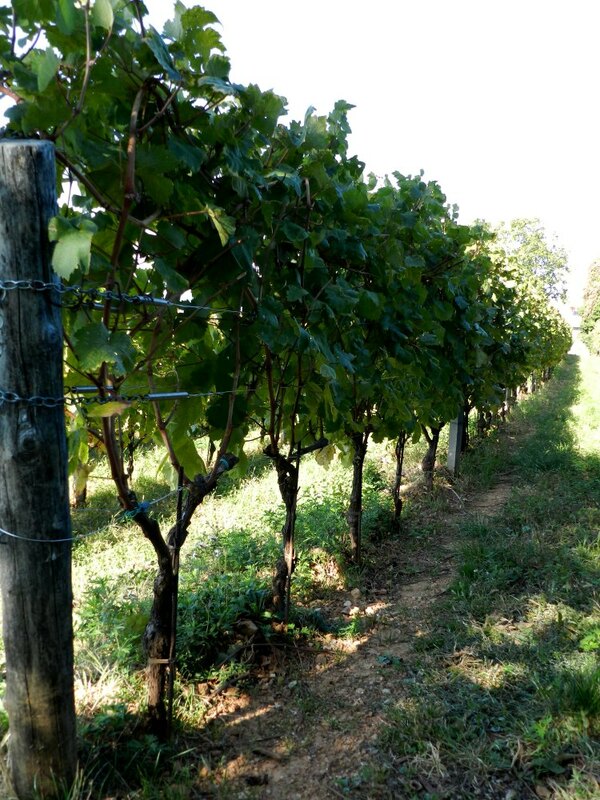 It’s not easy to grow grapes here – the rocky outcrop has a scant covering of earth, and most producers have historically shipped in red iron-enriched soil from closer to Trieste, building high terraces upon their land. The vicious Bora wind is apt to whip through the vineyards, removing anything that’s not strapped down, and chilling anything that is to the bone (or branch). 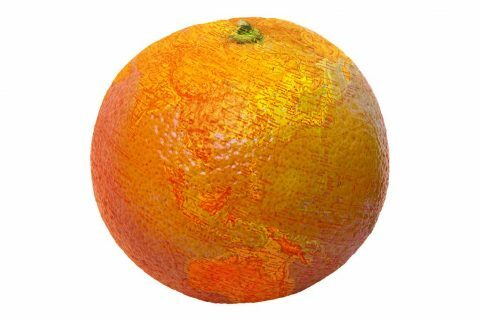 But having said that, there are many hours of sun, and a moderating maritime influence from the nearby Adriatic. Carso is home to some 40 small and often uncompromising producers. 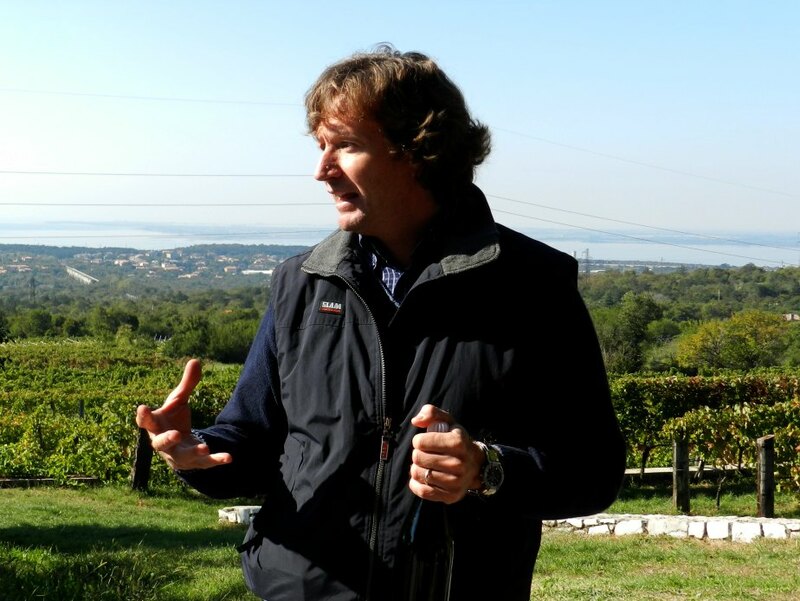 We visited three pivotal wineries, all within walking distance of each other: Edi Kante is unquestionably the reason that Friuli Carso is enjoying a renaissance today – in the 1980s, Edi began the drive towards quality. Fast forward and his wines are now available all over the world, including the UK and the US. Edi was in the States during our visit, but his nephew Goran related how techniques such as Guyot vine-training (the classic method used in Bordeaux and Burgundy) and Green Harvesting (stripping excess fruit from the vines, to reduce yields and increase quality) were introduced in the 1980s and 90s. Apparently Edi’s father was practically in tears during the first few green harvests, unable to understand how throwing away 25% of the crop was going to help the Kante business. 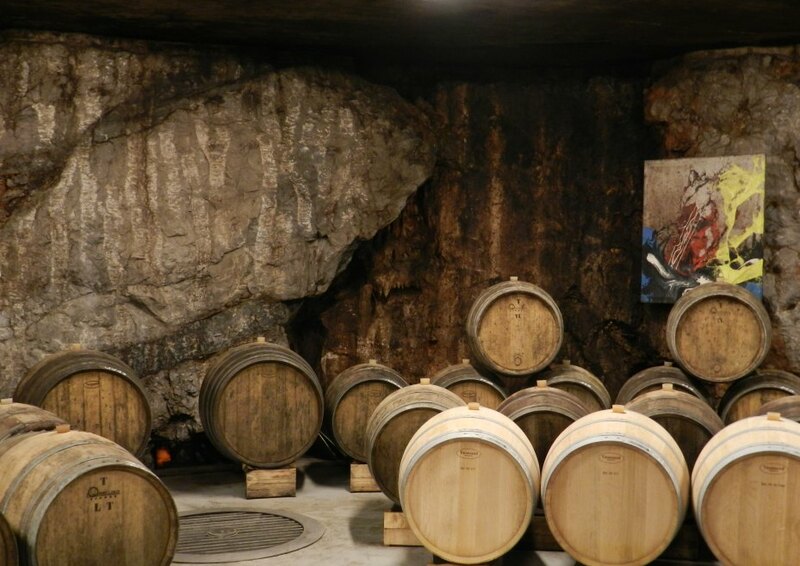 The Kante winery is something to behold, with three sizable underground cellars, one below the other, hollowed out of the rock. Edi is also an artist, and his modernist canvases are littered in every corner and crevice of the winery – and on the bottles themselves. The Kante philosphy is very much about freshness and fruit purity, something that was evident as we tasted the white wines. The 2009 Vitovska has attractive green melon notes, while the 2009 Malvasija has more florality, an almost salty savouriness plus a fine almond finish. The “KK” traditional method sparkler (A blend of Chardonnay and Malvasija) is very elegant, with some toasty depth and a mineral finish. Finally, we tasted an impressive 2001 Chardonnay (“La Bora di Kante”), its weighty spiced apple and vanilla character reflecting rather tasteful oak treatment. Edi Kante is innovating with a variety of non-standard bottle and cork sizes, in an attempt to solve two issues: first, that the standard 75ml bottle is a little too large for two to share over a meal (hence the introduction of a 50ml bottle for some of the wines), and second, that the proportions of the magnum (rather than the size) are what results in superior maturation of the wine – so a 75ml bottle with a smaller neck and cork should produce the same result, but without the unwieldy size. Sandi Skerk, president of the local Consorzio Tutela Vini Collio e Carso, is a softly spoken yet clearly passionate winemaker. 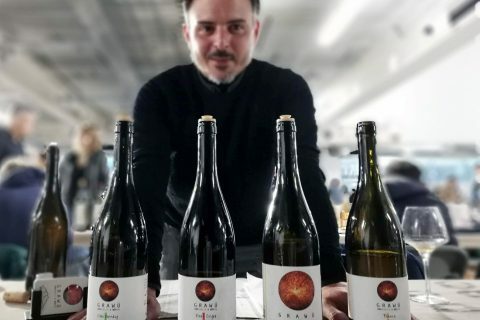 Sandi and his father Boris farm biodynamically, and their wines are made with a very light hand – there are no cultured yeasts, filtering or fining chez Skerk. 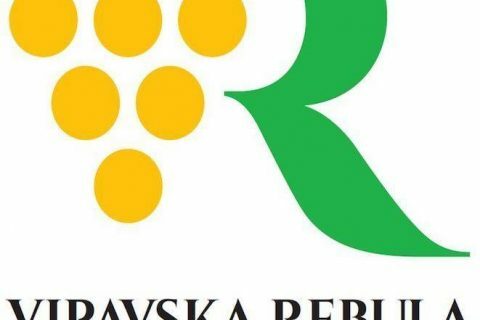 We tasted fascinating barrel samples of the Skerk whites – Malvasija Istriana, Vitovska (of which more later), Sauvignon Blanc and Pinot Grigio. These are wild wines in every sense, with long periods of skin contact lending them unusual hues. The scents and tastes are exotic and complex – none more so than the Pinot Grigio, a sludge-pink colour, almost tannic with a vast range of ripe stone fruit, wet stone and bready flavours. We also tried Skerk’s youthful Terrano, bottled mid-fermentation as an experiment. I didn’t take to the relatively high residual sugar, but liked the attractive prickle and almost chewy red-fruit texture. Sandi has organically certified the family’s vineyards, but not the final product, as he remains unhappy with the lax standards that the certification permits in the winery. 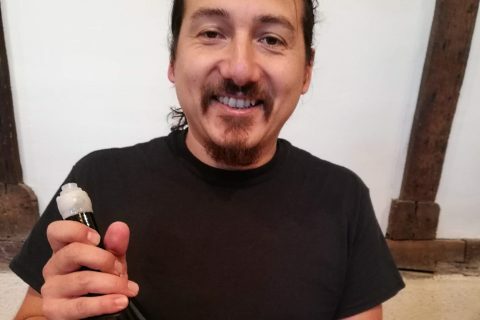 I admire his commitment – many are the vineyard owners who claim that they farm organically or biodynamically, but have all manner of excuses up their sleeves if the tricky matter of certification is raised. Skerk understands that in order to improve standards, it is essential to work within a system rather than throwing rocks at it. 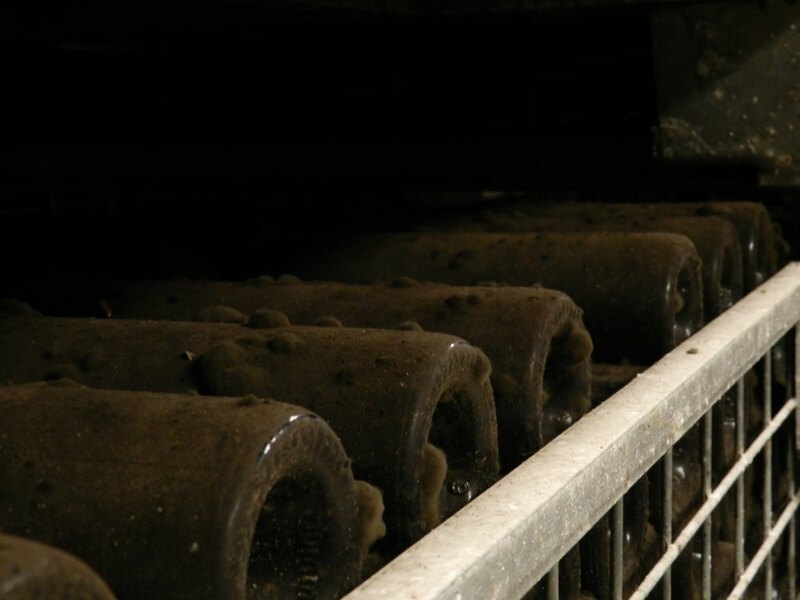 Like Skerk, the Zidarich modus operandi is very much on the natural winemaking tip – farming is largely biodynamic, white grapes mostly spend some time on the skins, and fermentation is in open-topped vats with indigenous yeasts. Benjamin Zidarich’s winery and cellars were built in 1996, entirely from local “found” materials, and are impressive to say the least. Benjamin based the cellar around a natural grotto buried deep in the Carso, and like the other wineries we visited, temperature control is achieved elementally rather than with technology. (60% Sauvignon Blanc, 20% Malvasija and 20% Vitovska) opens with grapefruit marmalade, giving way to a full, creamy texture and an array of stone fruit and floral notes. It’s rather marvellous. Skerk’s orange Ograde 2009 (Vitovska 50%, Malvasia 20%, Sauvignon 20% and Pinot Grigio 10%) is yet more single minded, with (on this showing at least) an overtly funky and rather reductive nose which leads to a complex, opulent and peachy palate. Zidarich’s varietal Vitovska 2009 was also outstanding, with nervy acidity and a profound apricot character. I’ll admit I was largely disappointed by the Terrano-based reds – The Zidarich 2009 Terrano (a clone of Refosk/Refosco) had good morello cherry fruit and structure, yet seemed somewhat lean. Edi Kante’s 1991 Terranum was even leaner – this had promising barnyard/animal hints at first smell, but although there was some bright red fruit, I felt that Terranum had become almost terminal, with acetic overdose just around the corner. Like any self-respecting Italian region, Friuli Carso has one grape which is pretty much unique to the area. Vitovska turns out to be a cross of Prosecco Tondo and Malvasia Bianca Lunga, and probably originated in Slovenia (where it is also known as Vitouska or Vitovska Garganja). It’s characterised by thick skins, and thus an ability to withstand the Bora wind, powerful acidity, floral notes and considerable versatility depending on the treatment in the winery. 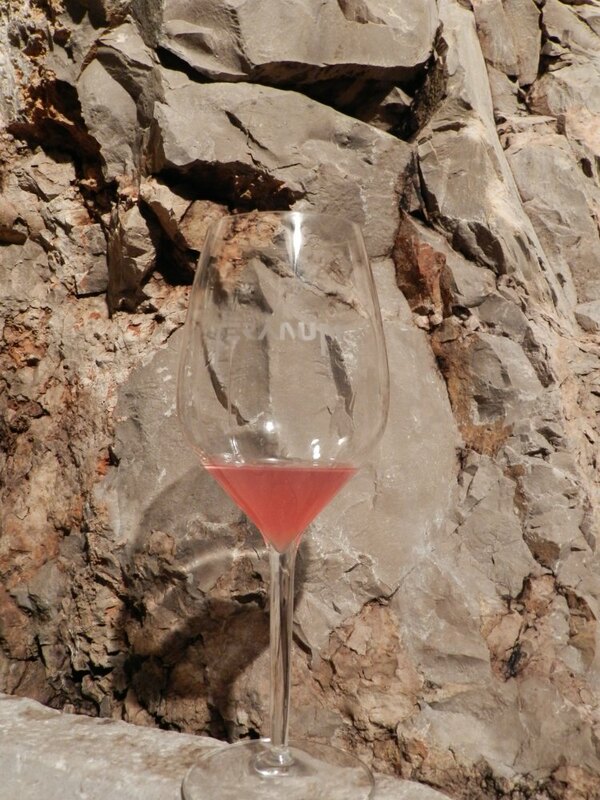 Vitovska has been saved from near-extinction by winemarkers like Sandi Skerk, Edi Kante and Benjamin Zidarich. The Carso is truly fascinating – respect for tradition and the environment mixes effortlessly with a desire to innovate and push the boundaries. The wine-making here is ambitious, daring and yet utterly rooted in the “terroir”. I urge readers to seek out these wines (especially the whites). What a terrific and informative post. Most appreciated your crisp comments on the varietals and the wines we tasted. I’ll cite your input in my post. Thanks…and a pleasure to have met you. Arnold, thank you! (and likewise, a pleasure to meet you). I did enjoy researching this – it was fasinating to find out about Vitovska (who knew Prosecco was in the mix there?). I actually found a treasure trove of information on grape varities here: http://www.vivc.de/index.php – not user friendly in the slightest, but there’s more information here than anyone could ever need (and I need a lot!). I must post all my Carso photos up on flickr – I’ll link to them here when I do, as I’d have liked to squeeze in more pics of those amazing underground cellars. Looking forward to your pics so be certain to send out a tweet when they are up. Another resource that is worth noting is some posts by Elizabetta Tossi. She was on the trip with us and a strong Carso booster. 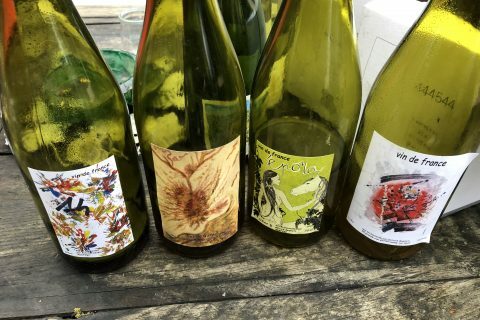 An excellent well-researched piece about a tiny region which was fascinating to discover, meeting these dedicated producers all making idiosyncratic, very good wines. I tend to agree with you about their reds though. Carso was a great discovery not only for me, but for many of us. 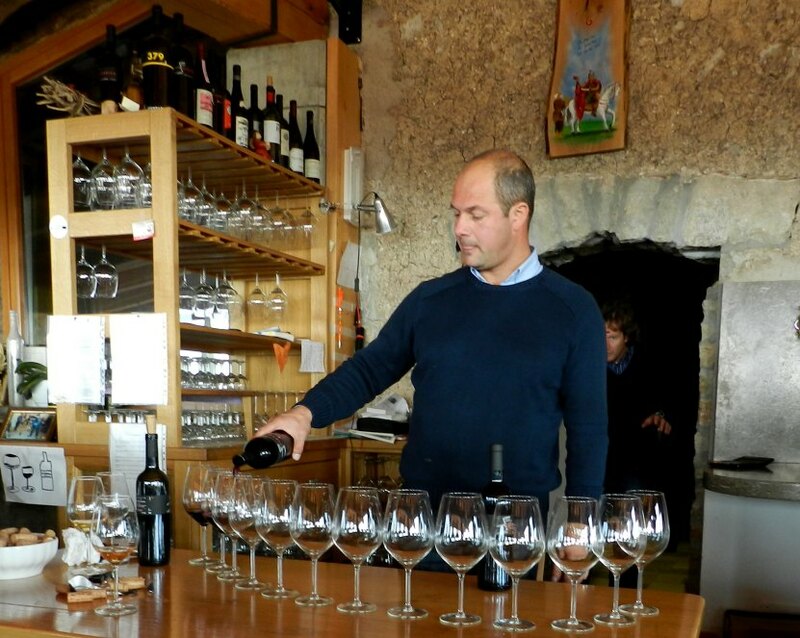 In fact we shared a bottle of Kante Vitovska 09 with, Jacques Maillet, a top Savoie producer when we visited him a few days ago, so I am sure he will also enjoy this post! Thanks Brett! The one thing I don’t have is any more bottles of these wines. I will surely be putting in some orders soon, although the memories haven’t faded just yet.